NumberRings App makes it very easy for a child to see how calculations actually work. 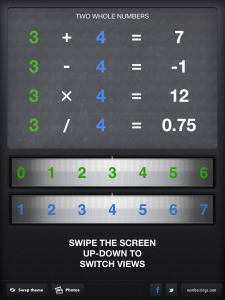 Multiple calculations and their results are shown real-time while you only adjust the numbers with the touch sliders. With NumberRings you can ask children to notice how numbers work while they are looking up answers to specific tasks. You can also use NumberRings to give “stretch” tasks to kids so that they can more easily learn specific patterns you want to teach them. 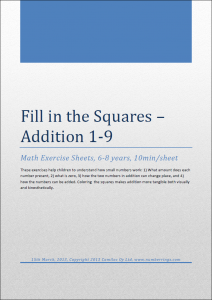 These 3×3 grid exercises help children understand how small numbers work: 1) What amount does each number present, 2) what is zero, 3) how the two numbers in addition can change place, and 4) how the numbers can be added. Coloring the squares makes addition more tangible both visually and kinesthetically. 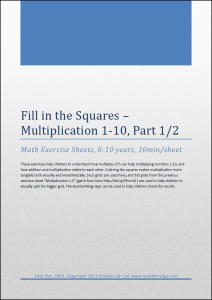 These exercises help children understand 1) how multiplication works with small numbers, 2) how addition and multiplication relate to each other and 3) how the two operands can be exchanged. Coloring the squares makes multiplication more tangible both visually and kinesthetically. 5×5 grids are used here as a preparation for grids with bigger numbers. 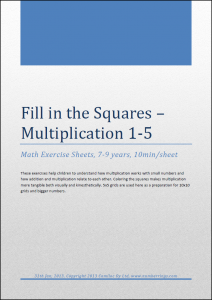 These 5×10 grid exercises help children understand 1) how addition and multiplication relate to each other, 2) how numbers 6-10 can be split and 3) how multiplication can be split to components. Coloring the squares makes multiplication more tangible both visually and kinesthetically. 5×5 grids from the previous exercise sheet “Multiplication 1-5” are used to help children to visually split the bigger grid. These 10×10 grid exercises help children understand how multiples of 5 can help multiplying numbers 1-10, and how addition and multiplication relate to each other. Coloring the squares makes multiplication more tangible both visually and kinesthetically. 5×5 grids from the previous exercise sheet “Multiplication 1-5” are used to help children to visually split the bigger grid. These 20×20 grid exercises give the student a visual model for multiplying numbers between 10 and 20. Colors and the spacing between the grids make this visual model easy to remember. Coloring the squares makes multiplication more tangible both visually and kinesthetically. Repeat exercise helps children to make the visual split in their minds more easily.